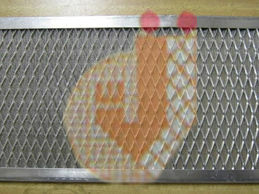 Mesh manufactured from knitting of wires into interlocking loops. Such interlocking or knitting results in strong, flexible, resilient, vibration reduction, sound attenuation, heat and corrosion resistance properties.Flat wires are also used where a larger surface area is required. Manufactured from wire of Galvanised Steel, Stainless Steel, Copper, Tinned Copper, Brass, Nickel, & many other metals.Wire diameter ranging from dia 0.6mm to 0.05 mm dia.